Several new polls released over the weekend show Democrats’ hopes of holding their U.S. Senate majority after Tuesday’s midterm elections are increasingly distant. One series of polls, which were released on Sunday and were conducted by NBC News and Marist, find Republicans ahead in a trio of crucial Senate races in Kentucky, Georgia, and Louisiana. There is increasing speculation the Senate majority could come down to runoffs in Georgia and Louisiana. Republicans need a net gain of six seats in order to flip the Senate. In Georgia, where Republican Sen. Saxby Chambliss is retiring recent polls have shown Democrat Michelle Nunn gaining momentum against Republican David Perdue. Many have had the pair tied. The NBC/Marist poll seems to indicate Nunn’s momentum has stalled and found Perdue leading 48% to 44%. If neither candidate gets above 50% of the vote, the race will come down to a runoff that will be held next month. The poll shows Perdue with a 49% to 46% lead in a hypothetical runoff. The NBC/Marist poll also showed good news for the GOP in Louisiana where incumbent Democratic Senator Mary Landrieu is facing multiple challengers led by Republican Rep. Bill Cassidy. According to the poll, Landrieu is leading Cassidy 44% to 36%, however, Louisiana will also have a runoff in January if neither candidate gets above 50%. The poll found Landrieu slightly behind Cassidy in a hypothetical runoff. According to NBC/Marist, Cassidy would defeat Landrieu 50% to 45% in a runoff. Another poll released by the liberal-leaning Public Policy Polling on Saturday looked slightly better for Landrieu, but it still found her unable to avoid — or win — a runoff. PPP found Landrieu winning Tuesday’s election with 43%, which is not enough to stop a runoff. It showed her narrowly losing a runoff to Cassidy 48% to 47%. 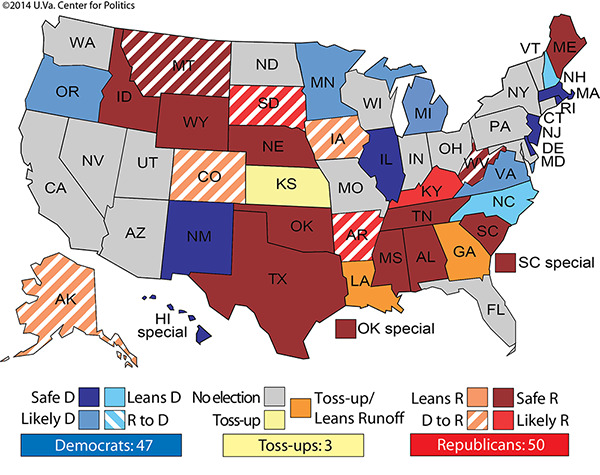 Centerforpolitics.orgA map from the University of Virginia’s Center for Politics showing how the Senate majority will like be decided by the race in Kansas and runoffs in Louisiana and Georgia. 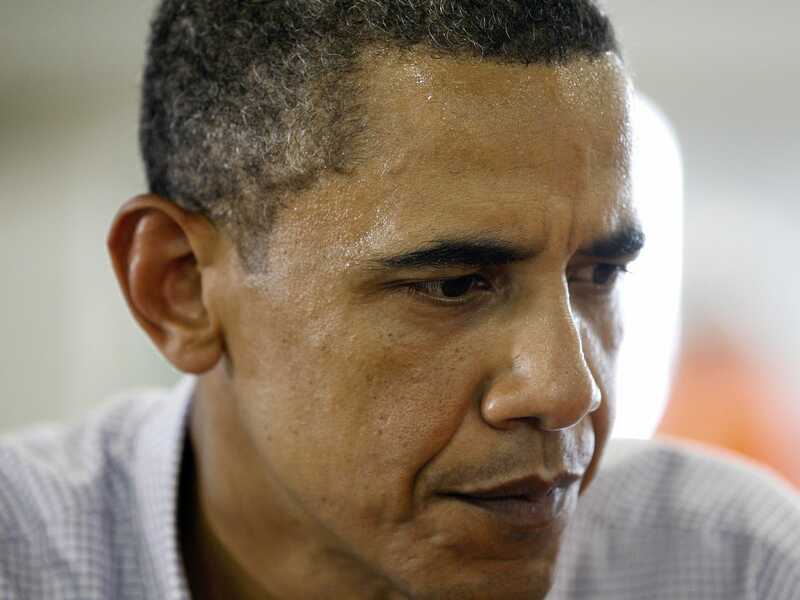 In addition to the two vital tossup states, the NBC/Marist poll found bad news for Democrats in Kentucky, where they were hoping to gain a seat. Polls in the Bluegress State have shown Republican Senate Majority Leader Mitch McConnell leading his Democratic challenger, Allison Lundergan Grimes, for some time now. The NBC/Marist survey found McConnell ahead 50% to 41%. That nine point lead is a slight improvement on the eight point gap McConnell enjoyed in NBC/Marist’s last poll of the race, which was conducted in September. PPP’s new polling similarly found McConnell leading Grimes 50% to 42%. That’s a turnaround from April when PPP showed Grimes with a slim 45% to 44% lead. Along with the new numbers in Georgia, Louisiana, and Kentucky, other polls released over the weekend showed good signs for the GOP. In addition to the poll with Marist, NBC conducted a survey with the Wall Street Journal that was also released on Sunday. That poll found nationally 46% of voters want the GOP to take control of Congress on Tuesday compared to 45% who want the Democrats to maintain their Senate majority.